The Bell MX-9 motocross helmet is an excellent choice for riders who are looking or an affordable helmet. The MX-9 has excellent features both in performance and protection. More information about this motocross helmet can be found at the bottom of the page. Below we explain what makes the MX-9 so good. We look at the protection, styling and comfort of this high quality off-road helmet. 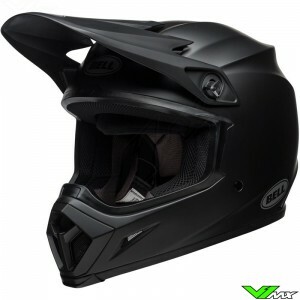 The Bell MX-9 motocross helmet is an excellent choice for a helmet in the lower prices class. 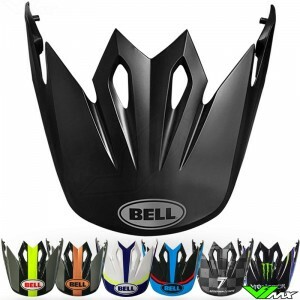 This Bell motocross helmet is specially designed for riders who want good protection at an affordable price. It has all kinds of technical features that improve protection and comfort. An example of innovative protection is the MIPS damping system. This system has been specially developed to dampen the rotation of the head after an angled impact. 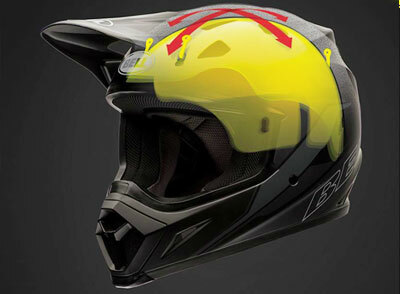 It consists of a rotating plane that has been incorporated in the motocross helmet. The rotating plane will dampen a rotation of the head and therefore reduce peak stresses. In addition to excellent protective properties, the bell MX-9 also has good cooling characteristics. It is equipped with the ‘velocity -flow’ ventilation system. A good flow of air is created through various openings on the front and back. Above the MIPS System are several channels that distribute air along the riders head. The shell is made of a polycarbonate and ABS construction. 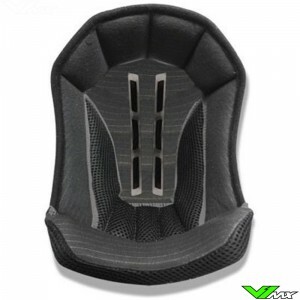 They have no less than 3 shell sizes, which helps to offer that optimal fit for every rider. 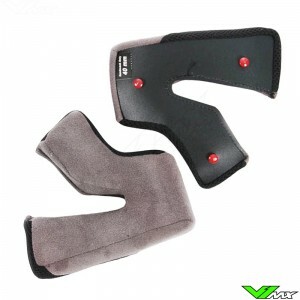 Finally, the inner lining of the MX-9 is equipped with removable and washable pads. The material used for the paddings is called X-Static and XT-2. These materials are antibacterial for better smell and hygiene. 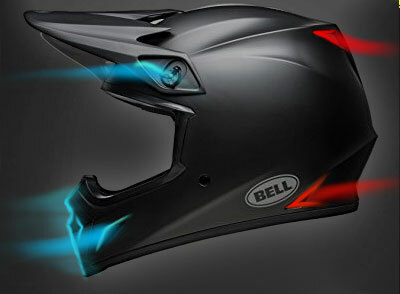 The Bell MX-9 has an aggressive style as we are used to from Bell. The iconic shell shape has a large mouth piece and a modern and aggressive styled peak. 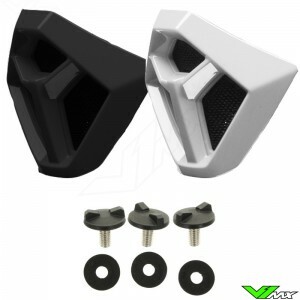 The mouth piece has a roost protector to keep stones and sand away from you face. Graphic designs of the MX-9 are very beautiful and fit well with most modern offroad gear. One of the most popular versions is the Pro Circuit replica. This design is also worn by riders of the Pro Circuit Kawasaki team and is characteristic because of the large monster energy logo. 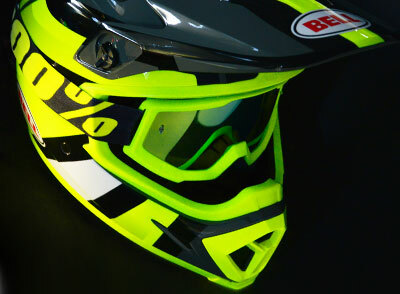 Bell is one of the few top brands that produces official monster energy motocross helmets. There is also a wide choice of other colors, whether you are looking for a blue motocross helmet or green motocross helmet, at V1mx you can always find one that suits your style. Bell releases the new collection every year around the summer, so keep an eye out on this page for the most recent versions. Size charts are displayed at all motocross gear with sizes, simply go to the product and click the ‘size chart’ tab. Below you will find a size chart for the MX-9. You can easily measure the circumference of your head by using a measuring tape. Wrap it around your head, about 2cm above your eyebrows. Keep the measuring tape above your ears and measure the largest size. If the helmet doesn’t fit, you can return or exchange for a different size without any problems at V1mx. We even have a 30-day period for returning or exchanging products. Since the 2018 collection all versions of this helmet are equipped with the advanced damping system. Are you interested in the Bell MX-9, but have a question about the product or placing an order? Feel free to contact V1mx by sending a message in the chat or send us an e-mail. We are happy to answer your questions, so that you can buy the motocross gear that meets your requirements. Because of the large range of offroad products, V1mx always has the product you are looking for!